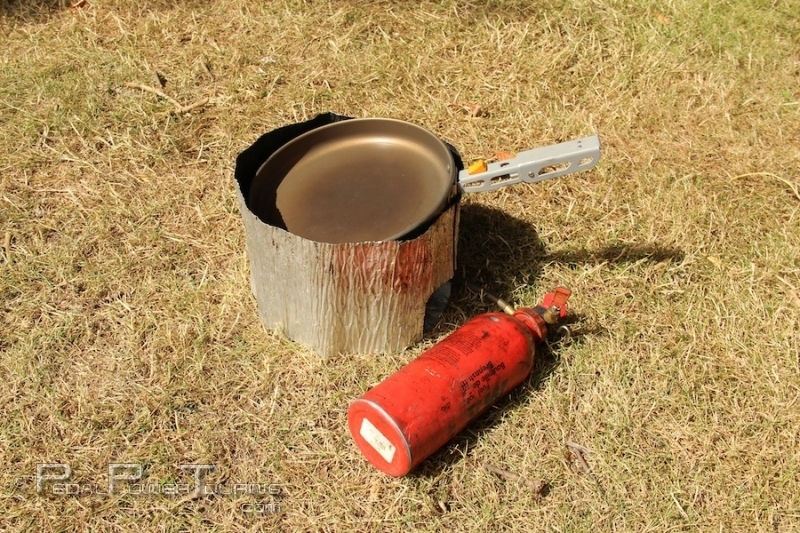 We have had our MSR Whisperlite International stove for nearly 5 years and it has never failed us, not even once. 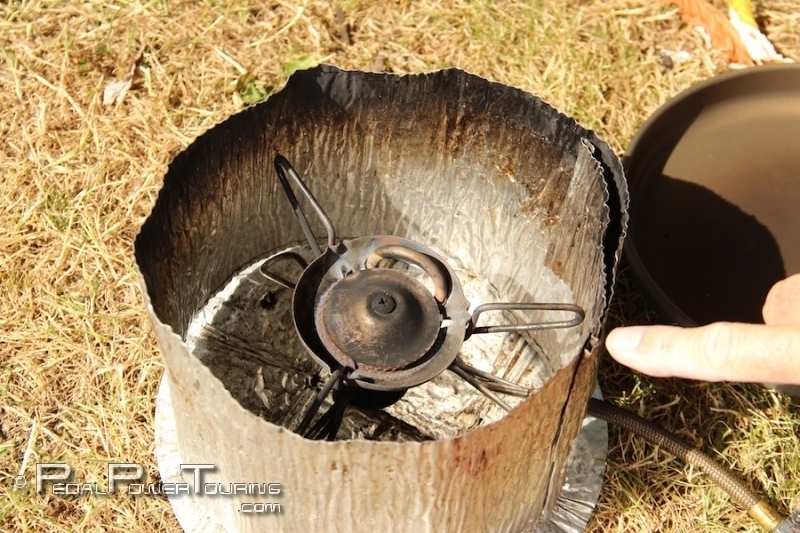 MSR has come out with a new stove in 2013, so this review is for the older stove. While cycling through Spain, we met a couple that had the 2013 MSR Whisperlite International stove, so we took a few minutes looking it over. It was brand new and not usedonce. There seems to be very little difference between the two stoves other than the new 2013 stove has better support legs. We have always used Coleman fuel in our stove until arriving in Europe. Being unable to find this type of fuel in Europe, we have since been using regular automotive fuel. The MSR Whisperlite International stove is designed to operate using automotive fuel and from our experience it performs just fine. With that being said, this is using regular automotive fuel in Europe and not in the U.S.. Most automotive fuels in the U.S. have ethanol added and ethanol will ruin your pump when used to much. 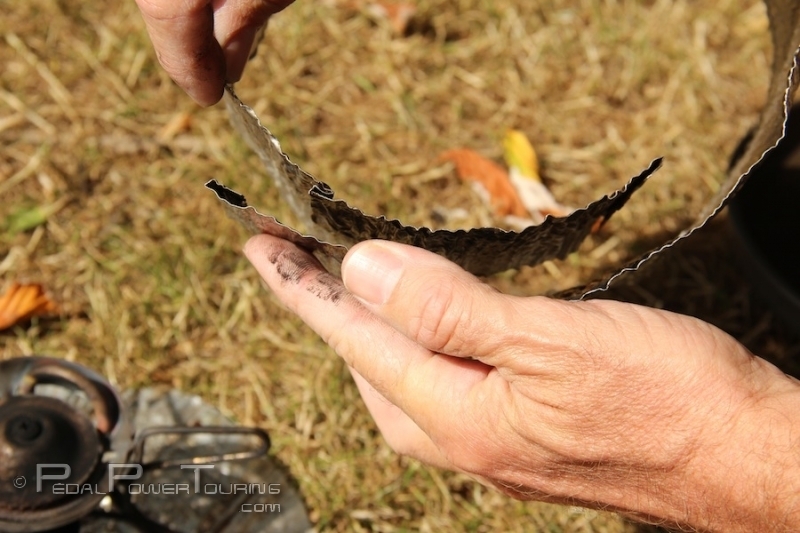 Ethanol is absolutely horrible for plastic parts and rubber seals, just ask anyone that owns a lawnmower or weed eater. 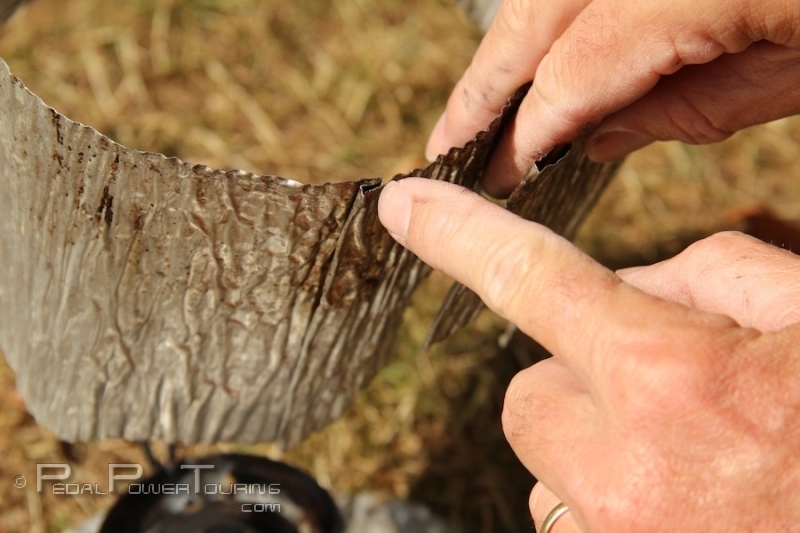 It is possible to find non-ethanol fuel in the U.S., but you will have to do some searching. 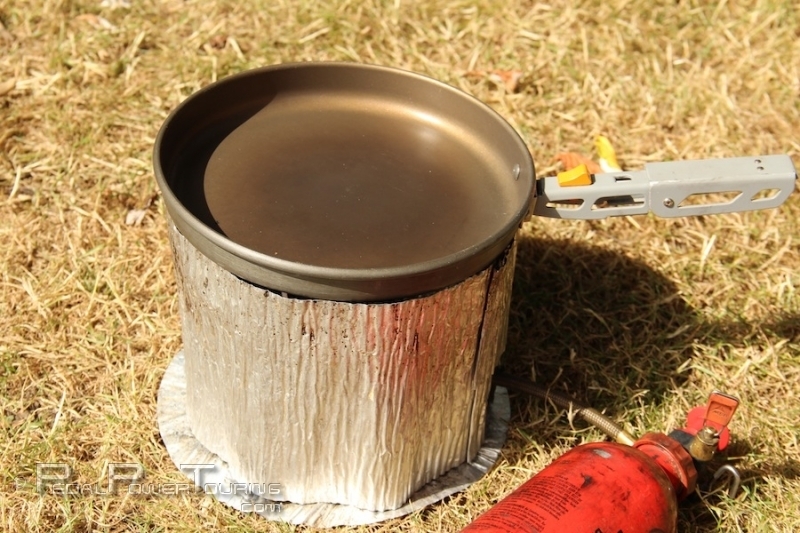 Unlike the traditional camping stoves, the MSR Whisperlite International needs to be preheated before cooking on the stove. This is accomplished by opening the fuel valve allowing a small amount of fuel to fill the priming cup located at the base of the stove. There will be a fairly large flame at first, but it will begin to die down as the fuel burns off. 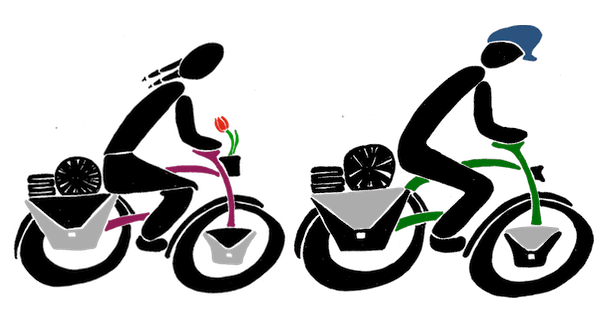 Before the flame goes completely out, open the fuel valve slowly. The flame may rise again, but it will settle down into a nice hot blue flame. You are now ready to cook. Important: If the flame goes completely out before having the blue flame, you must wait until the stove has completely cooled off before trying to light it again. It is possible to get it going again before the stove has cooled, but we are not going to encourage you to try it. 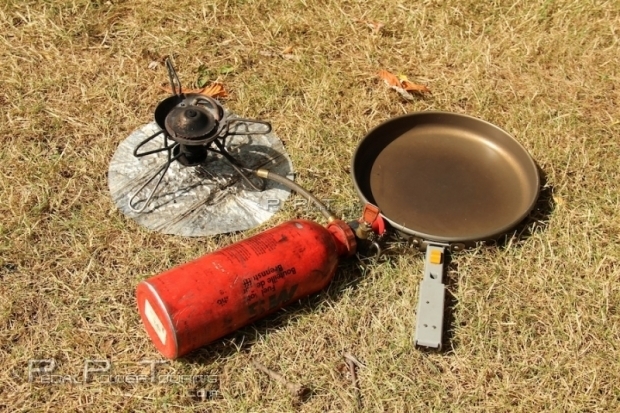 Although the MSR Whisperlite International is listed under “Simple Cooking“, we have prepared stuff ranging from boiling water to hamburgers on toasted buns. It is not always easy, but it can be done. The one negative thing about the stove is that it does not have a simmer control. However, with practice and the following advice you can achieve a “low” flame setting. First, do not fully pressurize the fuel bottle. Meaning do not pump it up 30, 40, or 50 times, 20 or so will be fine. If it was fully pressurized, release the pressure by slowly unscrewing the pump housing from the bottle (Do this away from any open flame source!) and then give it a good 20 pumps. Secondly, after the stove is preheated and there is a blue flame, close the fuel valve completely and then crack it open just a tad. Listen to the roar of the flame and try to get it as low as possible without allowing the flame to go out. 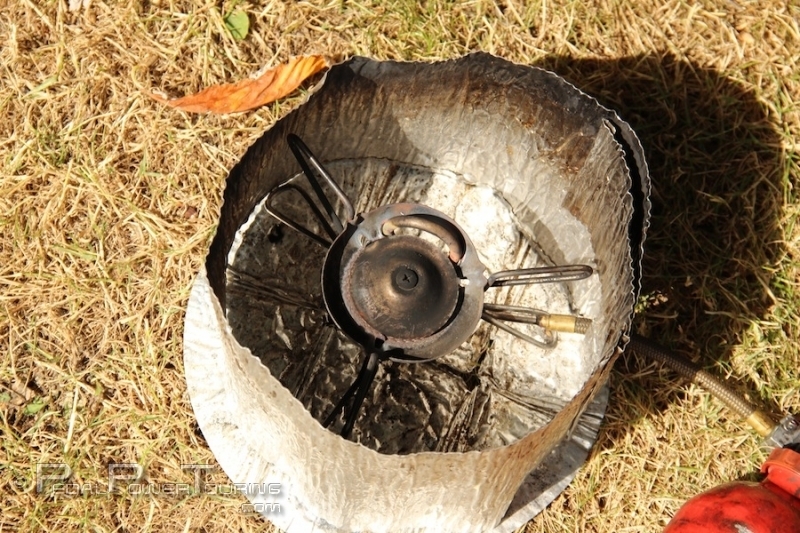 Remember, if the flame goes out, you will have to wait for the stove to completely cool down before lighting it again. 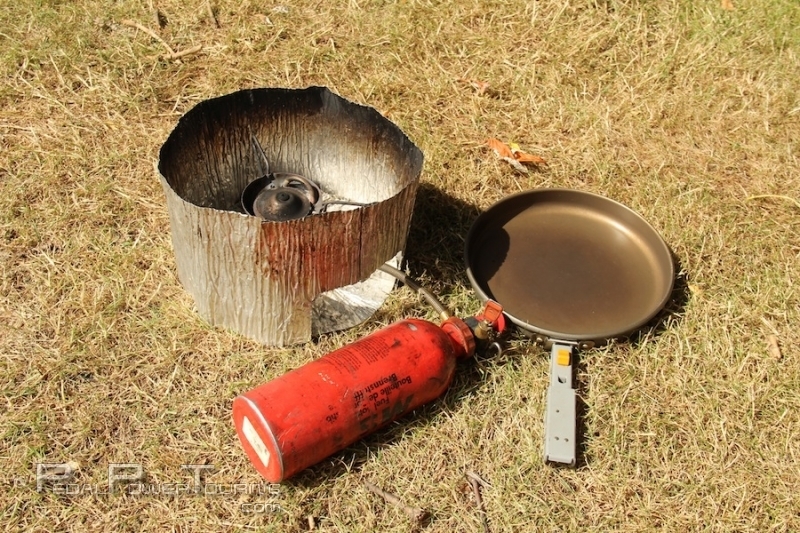 There are times that even with the “low” flame, the stove is still too hot and depending on your cookware you may not want to set it down directly on the burner. 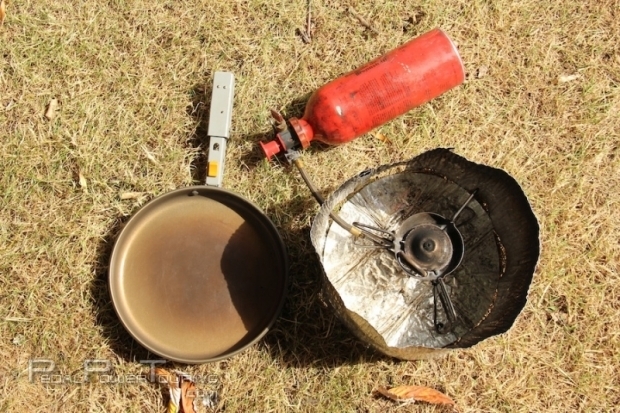 This will cause your food to burn and could damage your cookware. Normally we hold our frying pan a few inches above the flame while cooking and this works for the meals we are preparing. 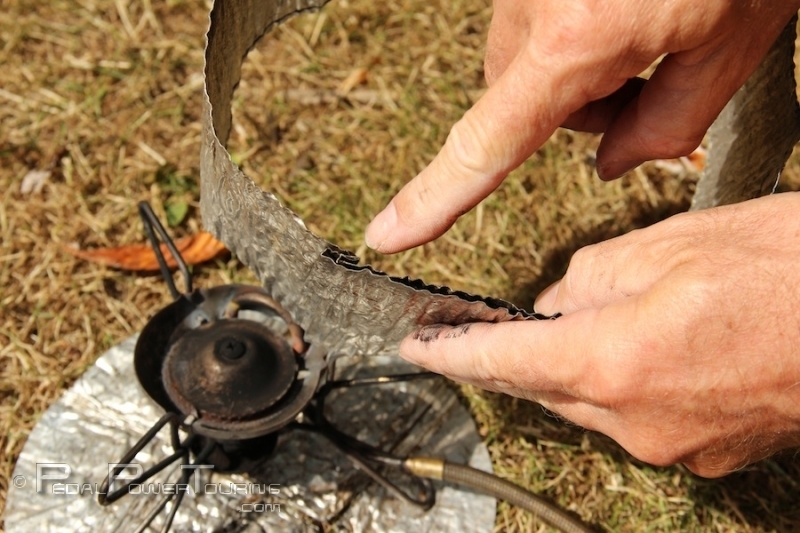 However, there are times when holding the pan will not work and for this we use our windscreen that came with our MSR Whisperlite International stove. We added a crease to the windscreen allowing us to shrink the diameter narrower than the size of our frying pan. This keeps the frying pan a couple inches over the flame and will allow the chef to give their hand a break. Even though the frying pan is not directly on the burner, it may still be too hot and burn your food, so be careful. 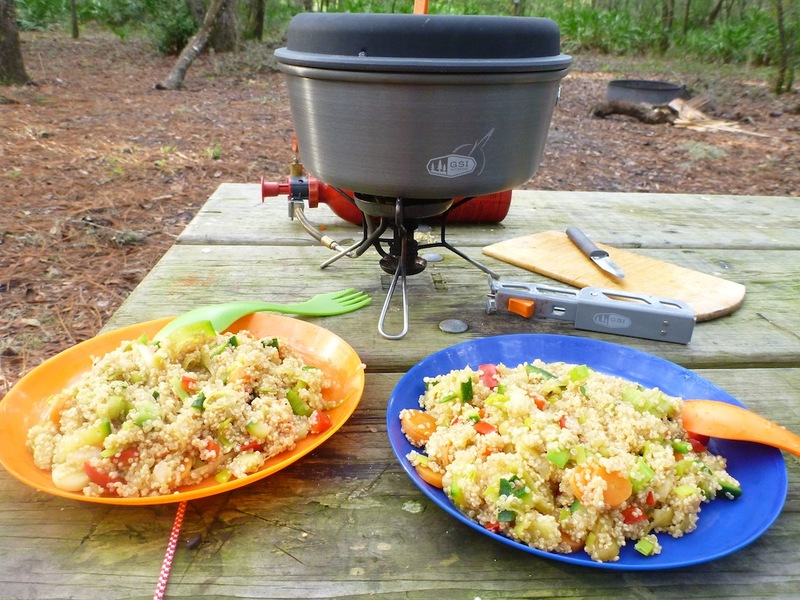 In summary, we are very pleased with the MSR Whisperlite International stove and would recommend it to other bicycle tourists, backpackers, and/or outdoor enthusiasts that need a stove that operates on multiple fuels. If you are in the market for a new stove and decide this is the one for you, then please continue reading. We always encourage shopping and supporting your local Mom & Pop store first; however, if you are keen on shopping through Amazon, please use the link provided below or the one located in the footer section of the blog. We get a small kickback and all proceeds will go towards maintaining our blog. Thank you!